Subscriptions: Rs. 1,38,830; Membership fees: Rs. 10,500; Bank interest (including interest on fixed deposits): Rs. 2,02,634; and Donations: Rs. 75,000. The amount received by way of Grants was Rs. 13, 00,000 and from the National Bioethics Conference (NBC- 6) was Rs. 20, 09,461. 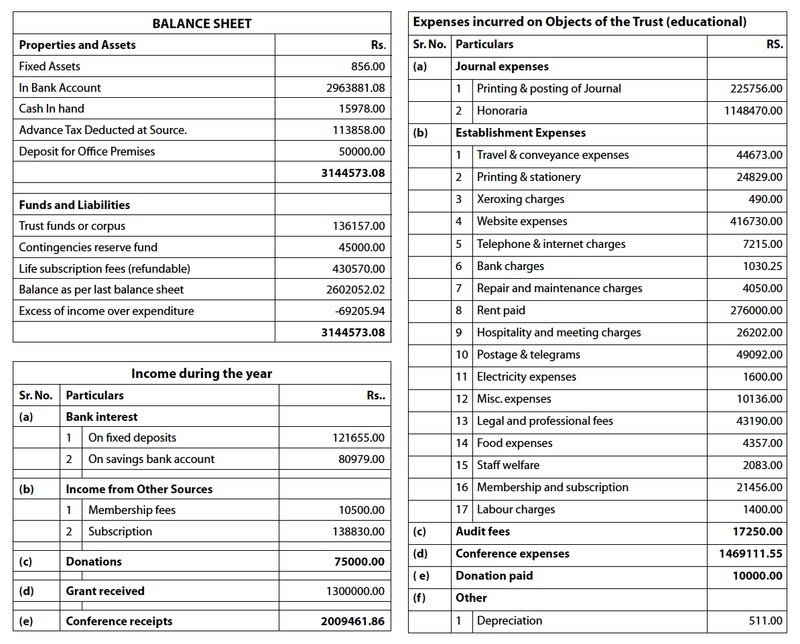 During the year 2016-17, we incurred expenses for services of regular staff, payment of honoraria and printing of the journal. The Forum for Medical Ethics Society spent Rs. 2, 25,756 on printing the journal and Rs. 11, 48,470 on honoraria. Approximately Rs. 9, 34,533 went into establishment and other expenses, including website charges; and an amount of Rs. 14,69,111 was spent on the Sixth National Bioethics Conference (NBC 6).